I've read the datasheets on it and I know I need to change BSEL0 (pin AD6) from high to low. Am I right in concluding to do this I need to insulate the pin or do I need to short it to a ground pin? Connect it to ground, preferably through about a 100 ohm resistor, but probably just taking it straight to ground will work. would connecting it to BSEL1 wok as this is already st to LOW or would this short something that I shouldnt? Probably, but quite frankly I don't know enough to be certain. Generally, you don't tie pins to a voltage rail directly because you have the potential for biasing the chip substrate into a state that you don't want. Adding a resistor provides a safety margin. That being said, it generally doesn't cause a problem to tie a pin directly to ground, or to tied three or four pins together at the same point. From what I can gather BSEL0 on the chip connects to nothing where as BSEL1 is Low which I think means it's gruonded. So my thinking is that to trick the board into believing both BSEL pins are low a small piece of wire between the two BSEL pins would giver the Low signal to the board and run at the fsb that this configuration is for. I'm gonna try it tonight, if it isn't successful is there much of a chance of damage or would reversing the wiring put things back to normal? 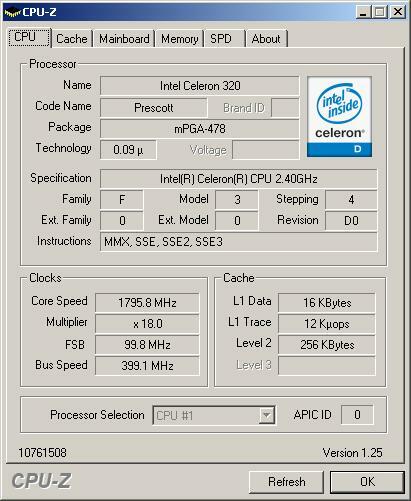 Just a thought, instead of trying to underclock the processor to 1.8Ghz, why dont you just buy a second hand processor off Ebay, or do i not get the plot here? If the load temperature difference is only 2C is it really worth the effort and 600Mhz sacrifice?? 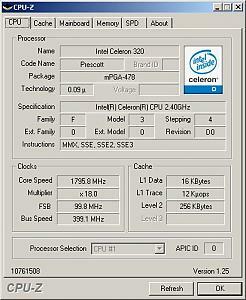 celly D runs cool anyway, there is no reason to underclock. why dont you give it a try at stock, and the if it overheats, then spend the time underclocking it? EH WHAT?!?! IT "STANDS ON TWO CLOUDS"? THAT DOESN'T MAKE ANY SENSE! LET ME TURN MY COMPUTER OFF! anyway, good luck on the underclock. « The common Question, but i need your help!